I always concerned to the built-in keyboards in pocket computers with suspicion. 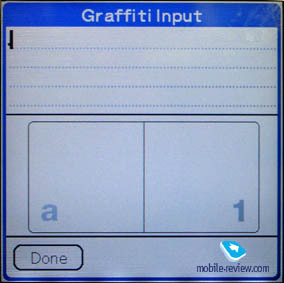 I always liked Graffiti - more conveniently and more practical, after all - appreciable feature in Palm computers. And so, prejudiced, I approached to the review of new Sony TG-50. For some reason it seemed to me, that this is not so thought over computer, a tribute to fashion and to market. You see as it turns out - everybody release computers with the built-in hardware keyboard, and why we are worse? Basically - you don't. But, as it was found out later (during that review) in spite of the fact that the novelty from Sony has some lacks, it is, no doubt, the premiere, deserving the most steadfast attention though, I certainly would like to see instead of the built-in keyboard virtual graffiti area. Rather usual green box in Sony style. It is pleasant, that into the standard kit is included cradle, we has been disaccustomed to it, if remember, with the majority of last models Sony gave only synchronization cable. From "excesses" in the box there is only hand breast-band - any headphones and soft covers are out of the question! Further all is by minimally prescribed list - literature, power supply adapter, CD with programs. Hereon I'll stop in more detail, in fact the design forces potential buyers to stop the look at this handheld computer. 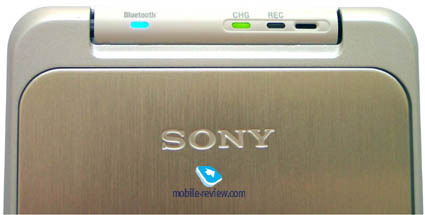 First, you pay attention to the screen, in fact it is much smaller, than in previous models from Sony. Of course, because now it is not incorporated with the graffiti area and therefore it is square. I'll say at once - it looks wildish. All construction is similar to very advanced calculator, but in no way to pocket computer what we have got used to see it. Under the screen locate hardware buttons and the keyboard. 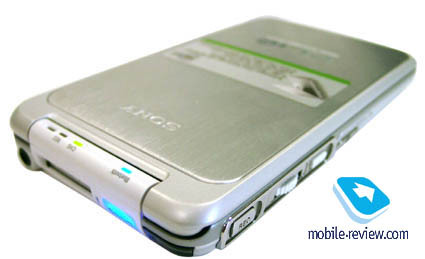 There are 7 hardware buttons in new pocket computer now, taking into account that the scrolling upwards and downwards button is unified and is similar to that Sony has showed us in models T415/615 - a certain similarity of flat joystick capable to move upwards and downwards. Not so conveniently, especially, if the question is games. In all the rest functions of scrolling buttons with success incurs JogDial without which here, naturally, has not cost. Also, in the computer there are 4 standard application starting hardware buttons: diary, notebook, to do and notes. 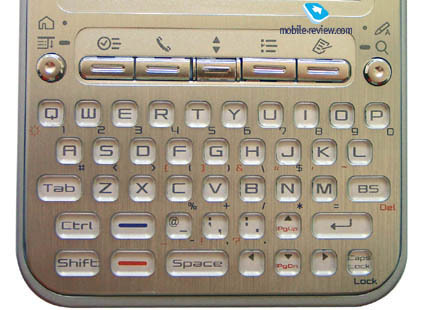 Two more buttons are know-how in pocket computers and locate on both sides from the line of standard hardware keys. Both buttons process two types of pressing - short and long. Short pressing of the left button brings out the user to "small house" - the basic applications menu, long - calls the menu. Brief pressing of the right one calls graffiti area, and long - makes search active. 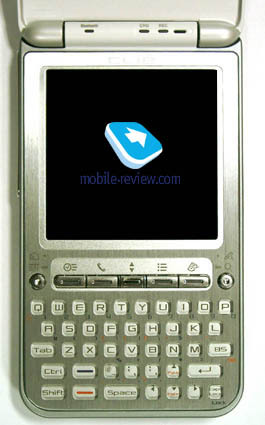 The hardware keyboard is similar to that has been submitted by Sony in NZ-90 model. Transparent keys with felt vertical motion, by sensations from pressing, I'll repeat, are similar to air-bladder bursting from packing material. To print on such keyboard it is possible with two big fingers - ten-finger method is out of the question. There can be up to 3 symbols on one key, which liven up by pressing of special keys - blue and red :-), depending on color with which are put designations. It's inconveniently only the fact that special buttons should be pressed simultaneously with necessary function key. 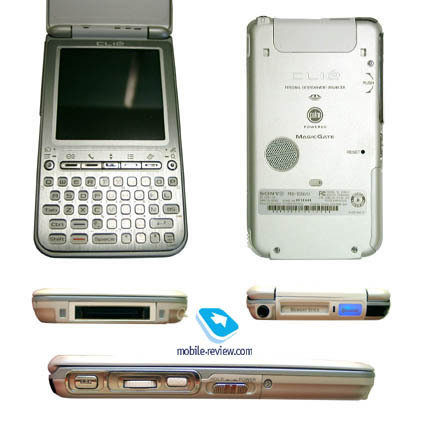 Also has disappointed the absence of opportunity to work with the handheld computer only with the help of the keyboard: for example, after the call of menu by button, it is possible to move through it with the help of stylus, or JogDial, scroll buttons, as well as the keys with arrows on the keyboard do not work here. By the way, there is no place for russification on the keyboard - designations are put too closely. The most remarkable is that the Japanese have guessed to make backlight for this keyboard and after pressing any button, all the keyboard is shined from within with the amber light, which by brightness is similar to backlight of Siemens phones. The screen and the keyboard are closed from above by the cover. Plastic with aluminum insert. The cover fastens on top with the massive hinge, similar to that is used in SJ-33 model. The central part of the hinge is occupied by indicator LED's (responsible for Bluetooth, indication of accumulators charge and sound record mode) and microphone. Also on top there is other big blue lamp responsible for indication of Bluetooth protocol. When it is switched on - it looks beautifully. The cover is inactive, i.e. its opening and closing in no way influence on condition of the handheld computer. The left end face is occupied by JogDial module, Power and Hold switch (in this model, as well as in SJ-33 it is one button: you move it downwards - the computer switches on, lock in extreme top position - gets in "Hold" mode). On the top of the left end face was placed the button of sound recording energization. The battery in this model is, it seems, demountable. Rather big bibb points to it, it's fixed by the small screw on the right. It means only that the replacement of batteries will be a priority of services-centers, instead of users. 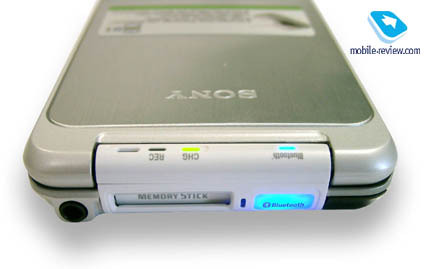 The top of the handheld computer is occupied by the infra-red port (improved - swings up to 4 meters), by massive lamp of Bluetooth condition indication, by MemoryStick slot (and, that is insulting, not MemoryStick PRO, but usual) and by jack for stereo headphones without remote control (at last Sony has placed it on the top, instead of sideways!). The right end face is occupied by special fastening for breast-band and by stylus which is inserted from below. From behind is striking only polyphonic speaker closed by gauze, everything else, including the "Reset" button - as before. TG-50 has the standard connector for periphery. 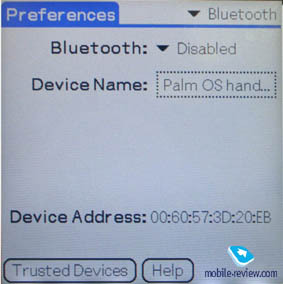 A few words about characteristics: processor: Intel XScale PXA250, frequency 200 MHz, OS: Palm OS 5.0, RAM, Flash-ROM: 16 mbytes each, built-in Bluetooth module (class 2, 10m). Some words it is possible to tell about the software. Basically it is already more or less standardized for Sony computers working under the 5-th OS, all the same it is not the first model of similar sense. Naturally, the user will find also Macromedia Flash support, graphic editor, picture album and tools for work with Internet and with cell phone. However there are also differences caused, first of all, by the presence of hardware keyboard. For example, is interestingly realized the Graffiti area which now emerges as earlier the program keyboard in the previous models, I have not found access to it in TG-50 for some reason. Probably, the developers have thought, that the hardware realized "keys" should suffice in plenty to the user. Sony TG-50 - is interesting piece, and the most important it is good and accurately made. As I have already designated in the article's title - this is a thing which is pleasant for taking in hands, everything is in the right places, is adjusted and thought over. You take it in hands and see: here have thought about the user, and still here, here and here - and it becomes pleasant. But, I am afraid, in Russia such thing will not get accustomed first of all because of complexities with russification of the keyboard - there is no place to engrave Russian letters and furthermore to glue labels, and it's difficult to work with this model without keyboard… But it is not necessary to be upset, it is enough to remember in what rhythm Sony releases new models of the handheld computers and it becomes completely clear, that during the month-another we'll see something new, maybe, more intended for life in Russia.